Thousand Oaks is home to some unique kitchen backsplashes; some of these are breathtaking, imaginative designs that challenge convention or fit a kitchen’s style perfectly while others are uniquely dated and unappealing. If you’re sick of looking at your tired backsplash and want to DIY removing it without damaging cabinetry, countertops, and the drywall awaiting underneath, then the tile experts at Transworld Tile are here to help. The basics of what you will have to do is to cut away grout on a starting tile, get it off, and then use your angled wide bladed scraper to pry tiles up and off with light taps from the hammer at the back of the scrapers handle. This will free tiles from the glue and grout that is holding them on, potentially in chunks, individual tiles, or broken chips of tile. Ensure power is killed to kitchen outlets, including garbage disposal, microwave outlet, etc. If you have a loose tile or easily accessible end, great! If not, you’ll have to create a loose tile by scoring away all grout with your utility knife and eventually lightly hammering it out with your wedge/flathead and hammer. Be very gentle with the first few tiles, and ensure that you clear a space wide and tall enough to fit your angled scraper directly onto the wall. Once achieved, all you need to do to clear open areas is continue to chip away at the under and back side of the tiles using your angled scraper. 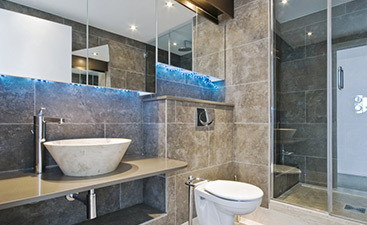 Tiles should fall away with minimal effort. For troublesome areas, such as along the top of countertops or next to outlet boxes, use a smaller scraper or your wedge/flathead. Finally, using your angled scraper or a 5-in-1 tool, scrape away any excess grout that did not come free with tiles. If required, you can sand the wall for further smoothness afterward. 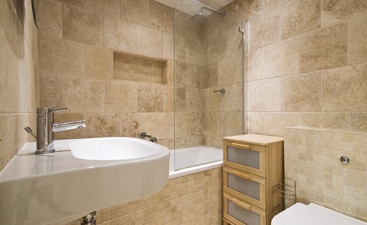 Your work will probably make a considerable mess, depending on the size and type of tile you are removing. Replace microwave, remove dropcloth, and empty all tile fragments into contractor bags for safe removal (be sure not to make bags too heavy). You’ll want to thoroughly dust, sweep and mop your kitchen after the demolition, if you plan to use your kitchen’s cooking surfaces. 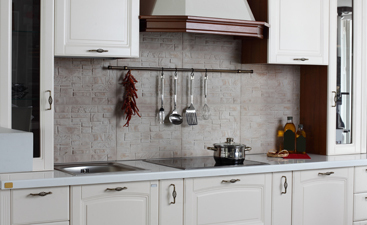 From here, you’re free to pick out your next kitchen backsplash tile.